I have created 10 Sixty Second Guerilla Podcasts and am in the process of casting them across the internet. 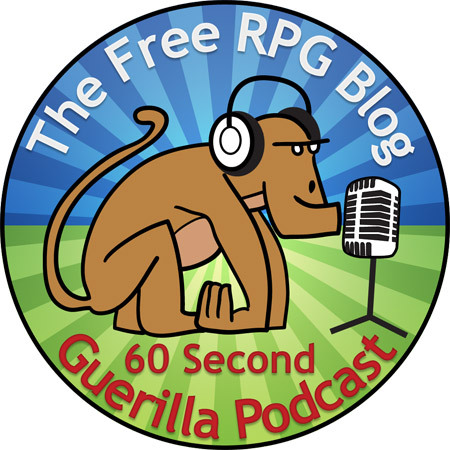 The aim is to spread the word of free RPGs by producing free RPG reviews in 60 seconds and having them played inside other people's podcasts. Over the next month or two, you will hear them in some of your favourite podcasts. Each one focuses on a different topic, some you'll recognise but presented in a very different way. Rather than tell you where the podcasts appear, I'm going to leave it to you, the readers, to find them. Shortly after the last one is aired, I'll create a big list of where they are. If you hear a Guerilla Podcast then please post in the comments the podcast where you found it! Let's see if you, the readers acting as a team, can find the Guerilla Podcasts before I post the big list. I bet you can't! I still have a few Guerilla Podcasts to hand out, if you're interested then please email me at brainwiped@gmail.com and I'll send you the details! You'll get a big, fat thank you and a link to your podcast when they are all played out. I'm relieved to say the first one has gone out the door! If you know who I am then you know where to find the Guerilla. It has been unleashed. Here. Be. Gamers. The Birthday HBG 'cast is all racked up ready for this lunchtime. :) Oddly excited to hear the Guerilla cast.